"Who's the mark?" United Artists & MGM have revealed the first trailer for summer comedy The Hustle, a gender-swapped remake of comedy classic Dirty Rotten Scoundrels from 1988. In this one, Rebel Wilson and Anne Hathaway star as two "down-and-out" con artists, one low rent and the other high class, who team up to take down the dirty rotten men who have wronged them. The original movie involves the two of them participating in a secret "loser leaves town" contest to see who can out scam the other. This one seems to twist that concept a bit, and move it to a different high roller town. Also starring Tim Blake Nelson, Alex Sharp, Ingrid Oliver, Emma Davies, and Douggie McMeekin. The original is a classic, and the way the two play off of each is brilliant. I'm not sure this one will live up to that, but it looks absurd enough. 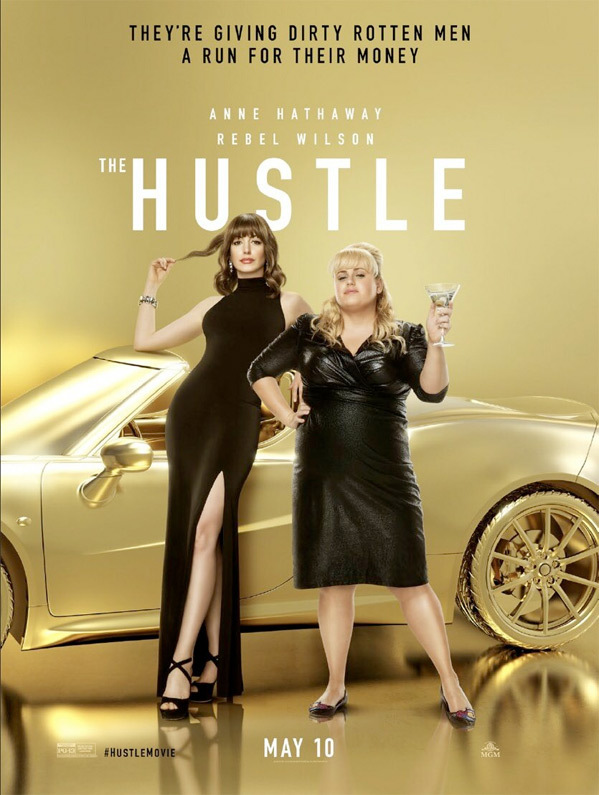 In the hilarious new comedy The Hustle, Anne Hathaway and Rebel Wilson star as female scam artists, one low rent and the other high class, who team up to take down the dirty rotten men who have wronged them. A remake of Dirty Rotten Scoundrels. The Hustle is directed by British actor-turned-filmmaker Chris Addison, making his feature directorial debut after directing episodes of "Veep" and a few other TV show episodes previously. The screenplay is written by Stanley Shapiro & Paul Henning, and Dale Launer, and Jac Schaeffer; from a story written by Stanley Shapiro & Paul Henning, and Dale Launer. United Artists & MGM will release Addison's The Hustle in theaters everywhere starting May 10th this summer. First impression?